You've waited more than a decade for it, and now the return of Venom to the big screen is just months away. Okay, maybe you haven't really been waiting for it; maybe you've dreaded the deadly symbiote's return after his lousy debut in Sam Raimi's Spider-Man 3. But at least now Sony seems to have a plan for the popular Marvel character, and after debuting a new trailer at Comic-Con days ago that footage is available for all to check out. 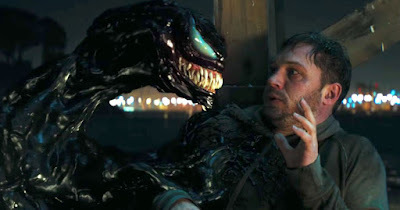 The latest footage takes us further into the madness, as Tom Hardy growls and mumbles Bane-like as Eddie Brock, who is sharing a body with a murderous alien symbiote. There's some great action here, but I would say the highlight is the back-and-forth between Brock and Venom as the creature takes deeper control and commits greater acts of violence. We also see plenty of Riz Ahmed as the movie's human villain, the head of a secretive foundation Brock had been investigating as a reporter. We also see another symbiote, and as I told you in my write-up of the trailer at Comic-Con, it's Riot and not Carnage as fans were expecting. Although there will probably be more. While I think watching Hardy jabber to himself will get tiresome eventually, I'm impressed that Sony and directsor Ruben Fleischer are making a film as dark and gory as this appears to be, especially with such a prominent Marvel character. Those are some pretty specific, and very nasty, threats that Venom likes to toss around. Also starring Michelle Williams, Jenny Slate, Scott Haze, and Woody Harrelson, Venom opens October 5th.